When you spend your days cleaning food up off of the floor and trying to convince someone who’s around 3 feet tall that they have to wear shoes when it’s 30 degrees out, you could probably use a laugh — which is where Twitter comes in handy. 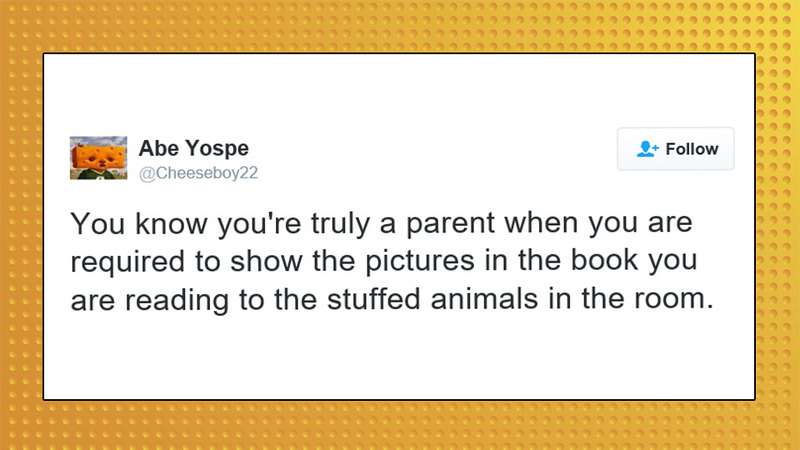 From parental election stress to all-too-common story-time rituals, here are this week’s funniest tweets from parents. If you don't keep a smushed granola bar of questionable date stuffed in your bag beneath tampons and a gross chapstick, are you even a mom? My son calls chicken nuggets "snack chicken" and I think it's high time we all do too. Person with one kid: I fear I'm doing everything wrong. Me: Have a second so you can be *sure* you're doing everything wrong. My 1 y/o just motioned for me to fast forward through the commercials of her show if you were wondering how generation z is coming along. Me shuffling through the fall leaves except it's all the Halloween candy wrappers my kids left on the floor. No matter if you're 4 or 34 if you tell your mom that something's wrong, she's going to ask if you need to poop. It's mom science. 8. So, that’s what it’s for! So cool how they invented Halloween just so parents would have buckets of candy to stress eat while watching election results. Pro tip: Heighten family experiences by visiting the zoo on a cold day when the animals are inside and the smell is especially pungent. My 5 yo started a sentence with, "After you die and I get married" so no, I don't think Disney has influenced her reality too much.